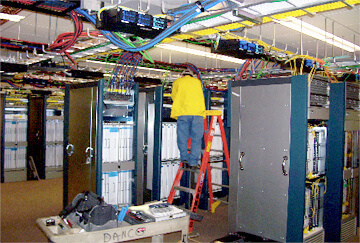 Danco Electrical Contractors of Raleigh has a well-respected specialty when it comes to servicing communications and data center projects. Although our industrial projects have included substantial installation projects, our commercial projects have increasingly become more complex with a need for more complex networks in the commercial sector. We understand that effective communication is a cornerstone of commercial success, and expert electricians at Danco are able to repair, install or upgrade your communication network for optimal efficiency and reliability. Danco invests in cutting-edge technology and is always on the forefront of technological advances in communication. We understand that an efficient communication infrastructure is an important, long-term asset to all commercial businesses, and our Raleigh electricians are experts in delivering electrical solutions that produce efficient, reliable communication networks. Contact us today to find out more about upgrading your communication network. Danco Electrical Contractors, Inc performed a complete data center upgrade by installing multiple generators for UPS systems, DC Data Center equipment, and all associated IT Equipment. We also had responsibility for de-energizing the building, providing all temporary power during the retrofit and installing a new breakers for the service feeds.